Welcome to the Upper School. 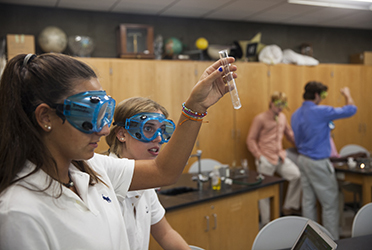 Academics is at the heart of the GA experience, and in the classroom we strive to balance tradition with a spirit of experimentation. Students read Hamlet, study the French Revolution, and learn physics, but many upperclassmen also initiate their own independent studies, join a STEM research group, study Chinese, or step to the microphone to give a senior voice. Our starting point couldn’t be stronger: the GA student. To me, a GA girl is someone who delivers intelligence, kindness, and 100% effort to whatever she takes on. Just as revealing as the dozens of advanced courses in our catalog is the absence of one high-school standard—study hall. GA freshmen are simply too industrious and motivated to need it. Of course, behind each student is an array of teachers and coaches who seek to support each girl and bring out her truest self. 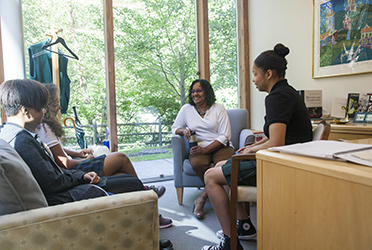 The GA faculty prides itself on knowing our students, a knowledge borne of conversation in the classroom and advisory—and long rides home from games, too. For me, the standard is still a recent graduate who wrote 27 thank-you letters to adults who shaped her experience. In high school, we sense the shape of things to come—something partly prophetic, yet never the whole story. 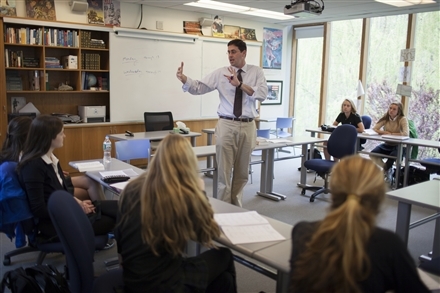 It’s the Upper School’s aim that girls feel a connection to the many great teachers at GA (and our brother school, Brunswick), discover deeper gears of effort and passion, and experience those few essential moments of courage—even simple ones like eating lunch at an unfamiliar table, seeing a teacher for extra help, or running for student government. Upper School may be the final part of a GA education, but our aim is to help the girls see education as a life’s work. In the words of the writer Jane Smiley, “You want your interests to outrun your actual days on earth.” What other way is there to live?